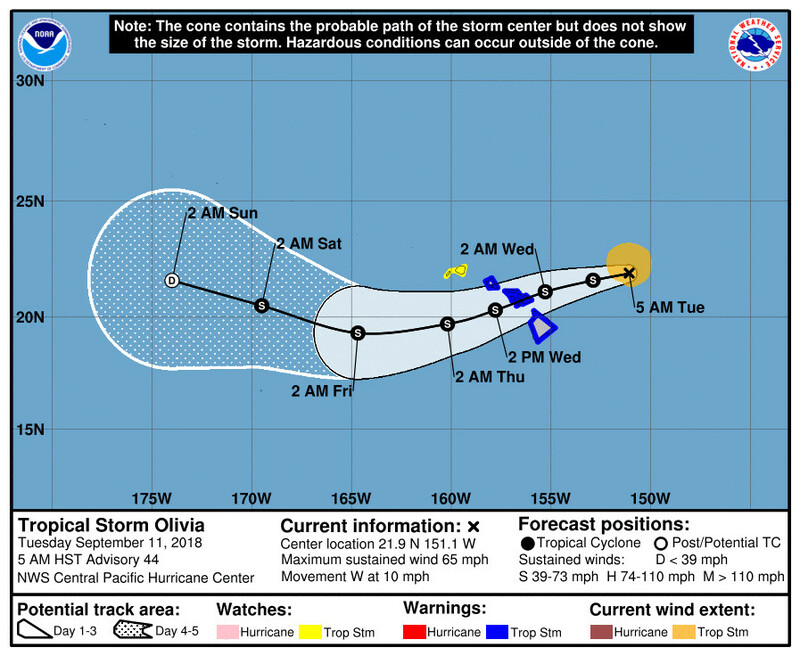 HAWAII ISLAND - Olivia remains a significant Tropical Storm with strong and gusty winds, heavy flooding rain, and high surf impacting the Hawaiian Islands far from the center of the storm. (BIVN) – Tropical Storm Olivia remains roughly 350 miles east-northeast of Maui, with the center of the storm moving west at 10 mph. Olivia weakened somewhat during the overnight hours, with maximum sustained winds this morning near 65 mph (100 km/h) with higher gusts. Gradual weakening is forecast during the next 48 hours, the Central Pacific Hurricane Center says, but Olivia is expected to remain a tropical storm as it moves over the islands. 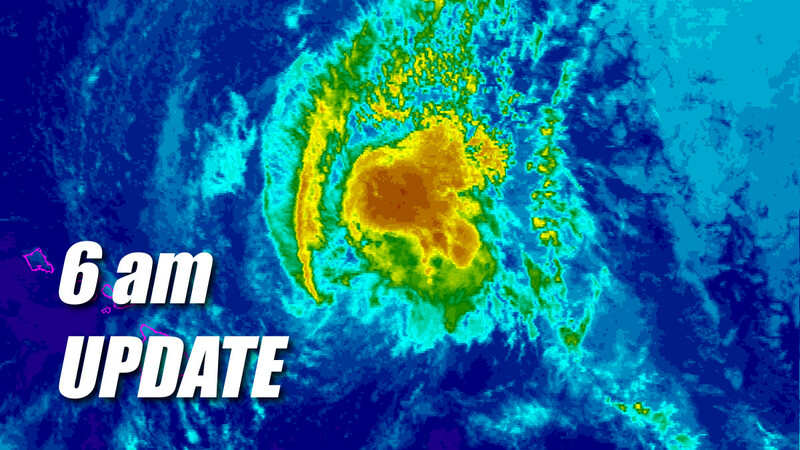 A Tropical Storm Warning remains in effect for Hawaii Island. A Flash Flood Watch and High Surf Warning for east facing shores is also posted. Maui and parts of the Big Island will be the first to experience impacts from Olivia tonight, with impacts then spreading westward to the rest of Maui County and Oahu late tonight into Wednesday. Do not focus on the exact forecast track or intensity of the storm, and be prepared for changes in future forecasts. Also, keep in mind that although Olivia is forecast to be a weaker storm near the islands than Lane, the impacts of Olivia could be significantly worse for some areas due to its passage directly over the islands. 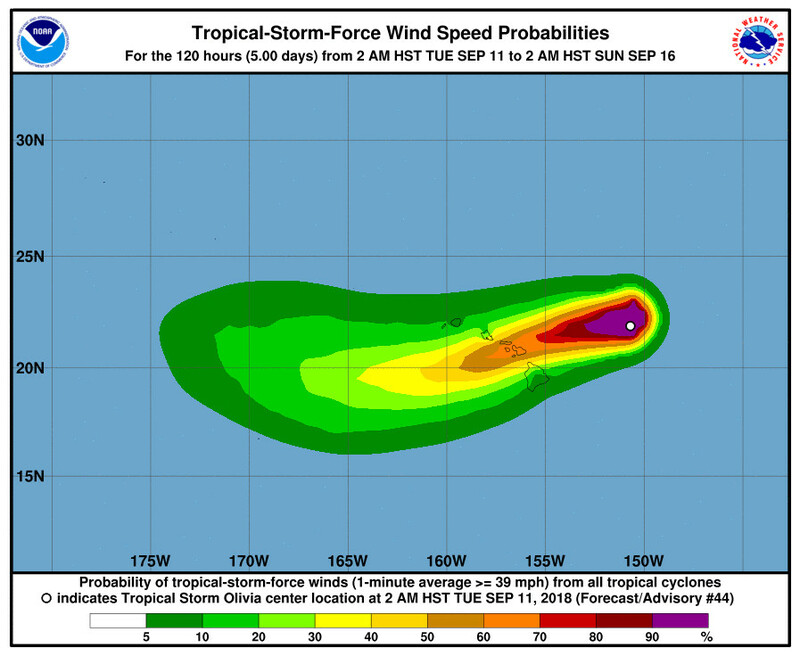 Damaging tropical storm force winds are expected to begin as soon as this evening across Maui and parts of the Big Island, spreading across the other islands of Maui County during the night into early Wednesday morning, and across Oahu on Wednesday. Wind gusts to hurricane force will be possible as Olivia moves across the state late tonight and Wednesday. Remember that the mountainous terrain of Hawaii can produce localized areas of highly enhanced winds, even well away from the tropical cyclone center. The chance for flooding rainfall will increase rapidly tonight and remain a significant threat through Thursday night. Storm total rainfall amounts of 10 to 15 inches are expected, with isolated maximum amounts up to 20 inches. Much of this rainfall will be focused on windward areas of the islands, especially from Oahu through the Big Island. However, flooding is still a significant threat for all areas. Swells and surf generated by Olivia will continue to slowly build through today, and reach damaging levels on some east facing shores later today through Wednesday. Surf heights along east facing shores are expected to reach up to 20 feet across Maui County and the Big Island, and 10 to 15 feet on all other islands. This surf is expected to result in significant beach erosion and overwash onto vulnerable coastal roadways, particularly during high tides. UPDATE (Sept. 11 at 9 a.m.) – The DLNR Division of State Parks has decided to keep all Hawai’i island park units open today, based on the current track of Tropical Storm Olivia. Hurricane Hunters from the 53rd Weather Reconnaissance Squadron spent most of the night flying through Olivia, sampling the core as well the periphery. Maximum flight level winds of 78 kt were observed in the northwest quadrant fairly early in the evening, but subsequent observations indicated that Olivia is well below hurricane intensity. The surface pressure was gradually rising, and the system exhibited tilt with height, with the low-level center on the south side of the cold cloud tops seen in satellite. Additionally, the observed wind field was rather asymmetric, with winds fairly weak in the southern semicircle. The initial intensity for this advisory is deemed to be 55 kt, and given current satellite trends, this may be slightly generous. The aircraft center fixes add confidence to the initial motion estimate of 270/9 kt. Olivia is being steered by a mid-level ridge centered to the distant northeast, but a mid-level ridge building to the northwest of Olivia will induce a motion toward the west- southwest later today. Once this occurs, this motion is expected to persist as Olivia crosses the Hawaiian Islands. The updated track forecast is very close to the previous, especially over the first 48 hours. In 48 to 72 hours, a low aloft is expected to develop north of Olivia, and this development is expected to impart a motion toward the west-northwest on days 4 and 5. The official forecast is now near the center of the guidance envelope, and is close to the multi-model consensus TVCE and GFEX. The along-track differences between the GFS and ECMWF were reduced with the arrival of the 06Z GFS, adding confidence to the short term forecast track, which indicates a slightly faster speed of motion than the previous forecast. Moderate shear is expected to continue over the next 48 hours while SSTs increase to 28C. The shear is expected to induce slow weakening as indicated by nearly all intensity guidance, with interaction with island terrain potentially contributing to weakening as well. After Olivia exits the Hawaiian Islands to the west in 48 to 72 hours, a cold core low aloft is expected to develop north of Olivia. By 96 hours the cold core low and Olivia become vertically stacked, potentially resulting in Olivia becoming post-tropical. The official intensity forecast indicates this will occur by day 5, and closely follows IVCN through the bulk of the forecast. 1. Although Olivia is expected to move over the islands as a tropical storm, it could still bring significantly worse impacts than recent Hurricane Lane. Those impacts could include intense flooding rainfall, damaging winds, and large and dangerous surf. 2. It is important to not focus on the exact forecast track and intensity when planning for Olivia. Regardless of the track that Olivia takes as it approaches the islands, significant impacts can be expected away from the center. In particular, the mountainous terrain of Hawaii can produce localized areas of strongly enhanced wind gusts and rainfall.